When Christmas came, Billy Brad's Uncle Peter Henry, who was quite bald and wore big spectacles with real tortoise shell rims and looked as wise as an owl, gave Billy Brad a big, round dollar, just as Billy Brad had hoped he would. He gave Billy Brad a pair of ice skates, too, but Billy Brad was more pleased with the dollar. "What are you going to do with it, Billy Brad?" asked Uncle Peter Henry, when Billy Brad had thanked him for it and kissed him for it. "Why, I'm going to put it in the Savings Bank," said Billy Brad. "I'm going to put it in the Savings Bank with my other dollars until I need it to pay it for rent to Mr. Giffen for the ground I am going to grow my corn on. Because this will be my rent dollar, Uncle Peter Henry." "That is a very good idea," said Uncle Peter Henry. "And I wish Christmas was every month, I do," said Billy Brad. "Why so, Billy Brad?" asked Uncle Peter Henry. "Because then I would get a Christmas dollar every month," said Billy Brad frankly. "And I need some more dollars for my corn farm, I do." "I see!" said Uncle Peter Henry, smiling. "A progressive young agriculturist cannot even grow corn without spending some money -- is that it?" "Yes," said Billy Brad. "Because Henny Staples had to, and he told me. He had to pay Mr. Giffen to plow the ground with his plow and horses, and he had to pay for the corn to plant in the ground, and he had to buy a hoe to hoe it with." "And how about fertilizer? Didn't he have to pay for that?" asked Uncle Peter Henry. 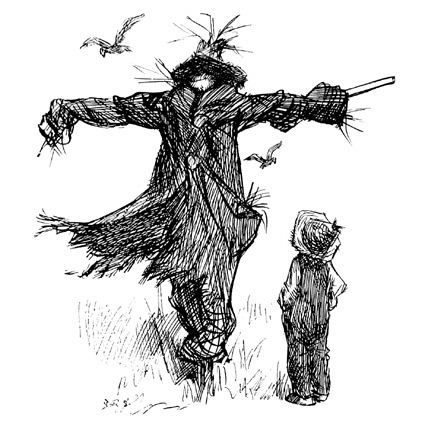 "Yes," said Billy Brad, "but the scarecrow he didn't have to pay for, because he made it. And I can make one, too." Billy Brad's corn farm was the thing he thought about most. All winter he had talked about it to his father, and to his mother and to Uncle Peter Henry, and hundreds of times with Henny Staples. He had walked over to Mr. Giffen's field many times to see just where his corn field was going to be, and he had made maps of it on paper -- dozens and dozens of them -- showing just how many rows of corn there were going to be. He really knew where every grain of corn was going to be planted. I believe he could have told Uncle Peter Henry just how many grains of corn he meant to plant. "It would give me great pleasure if you would let me furnish the coat for the scarecrow for the famous corn farm," said Uncle Peter Henry. "All right, you can," said Billy Brad, "if you've got a floppy one, Uncle Peter Henry. Henny says the floppy ones are the best kind." "I think I have a remarkably floppy coat," said Uncle Peter Henry, "and if you find you have not enough money in the Savings Bank to pay for all you need to start the corn farm properly I think I know a capitalist by the name of Peter Henry who can lend you the money you need. How many dollars have you in the Savings Bank, Billy Brad?" "Ten Dollars," said Billy Brad. "Ten Dollars!" exclaimed Uncle Peter Henry. "Why, you will not need to borrow. You are a capitalist yourself." "Am I?" said Billy Brad, and then he asked -- for asking was one of the things he did best -- "What is a capitalist, Uncle Peter Henry?" "A capitalist," said Uncle Peter Henry, "is a man who has capital." "What is capital?" asked Billy Brad promptly. "Wheat that has not been eaten, water that has not run over the dam, money that has not been spent," said Uncle Peter Henry. "It is wheat that has been gathered into the barn, water that has been stored in the reservoir, money that has been accumulated. Capital is part of yesterday saved to help us do the work of today and tomorrow. Do you understand that, Billy Brad?" "No," said Billy Brad frankly. "Well, now, let me see!" said Uncle Peter Henry, thinking hard. "You had a garden last summer, Billy Brad. You grew some radishes in it, didn't you?" "Did you eat all the radishes?" asked Uncle Peter Henry. "No. I couldn't," said Billy Brad. "There were too many!" "Too many for everybody in the world to eat?" asked Uncle Peter Henry. "Oh, no!" said Billy Brad. "Of course not, Uncle Peter Henry; just too many for me to eat by myself. So I sold them, I did. To my mamma." "And she gave you money for them," said Uncle Peter Henry; "and you put the money in the bank. And now you have that money to use. So, you see, you can use the radishes that were too many for you to eat; you can use them to pay Mr. Giffen for plowing your corn farm, and you can use them to pay for your seed corn, and to pay for the fertilizer. So really, it will be your more-than-enough-for-yourself radishes that will plow the ground and buy the seed and the fertilizer. Isn't that so?" "So that is what Capital is," said Uncle Peter Henry. "It is the more-than-enough that has been saved by somebody, or by many somebodies, or by all the somebodies in the world. It may be the more-than-enough radishes, or the more-than-enough wheat, or the more-than-enough water, or more-than-enough money. But all Capital is somebody's more-than-enough that has been saved for another day. Do you know what wheat is, Billy Brad?" "It's grain," said Billy Brad. "It grows. And they grind it up and make flour of it." "Yes," said Uncle Peter Henry. "And if a man has a wheat farm, and plows it, and harrows it, and sows the seed wheat, and the wheat grows and ripens, and the man reaps it, and threshes it, he has more wheat than he planted, hasn't he?" "Of course," said Uncle Peter Henry. "And if he has had a very poor year he may have just enough wheat for his own family to eat and no more. But if he has had a very good year he may have a great deal more wheat than that. But, no matter how much wheat he grows, he must eat some of it; or sell some of it for money to buy other food to eat. And some must go to pay the men who helped him. And some for clothes. And some for taxes or rent. And some for other things." "For the Red Cross," said Billy Brad. "Probably," agreed. Uncle Peter Henry. "But, after all, he has quite a lot of wheat left over. So what does he do with it -- throw it away?" "But he could, if he wanted to," said Uncle Peter Henry. "He could throw it in the creek and let the birds eat it and the rain spoil it, couldn't he? But what does he do with it, Billy Brad?" "He puts it in his barn," said Billy Brad. "In a bin, Uncle Peter Henry, don't he?" "Yes," said Uncle Peter Henry. "And the next year he may add a little more or a great deal more; or if he has a poor crop, he may take some out of his bin to use. But the pile of good, sound wheat in his bin is Capital. And now, suppose there is some land near this man's farm and it is waste land. It is all stones and brambles and scrubby trees and thistles, but good wheat land. From somewhere, a man comes and sees this land. He has just enough money to buy the land -- because it is so cheap -- but it will take him a whole year to clear the land and make it fit to grow wheat. If he can buy the land, and clear it, and grow wheat on it, there will be more wheat for all the hungry people in the world, but in a year he will have starved to death. How can he manage it, Billy Brad?" "Can he get some wheat from the man that has it in his barn?" asked Billy Brad. "He can," said Uncle Peter Henry, "and it is exactly what he does. He borrows enough wheat to keep him alive and comfortable for a year and, at the end of the year, he has his new farm all clean and growing wheat of his own, and he pays back the wheat he has borrowed, or part of it. So, because there was a man who saved his more-than-enough wheat, here is a new farm, growing good wheat. Isn't that so?" "But, sometimes," said Uncle Peter Henry, "no man comes to buy the scrubby land and make a farm of it. Then, very often, the man who has the bins of saved wheat says, 'I will make a farm of that scrubby land myself. I have so much good saved wheat that I can give some of it to buy that scrubby land. And I can give some of it to men to pay them for clearing the land. And I can give some to buy fertilizer. And I can give some to pay the men to plow and harrow and sow and reap and thresh. And I can use some for seed. So he does that with his saved wheat. And in that way a new farm is made, to grow good wheat to feed the hungry. Can you understand that?" "Of course you can," said Uncle Peter Henry. "You can see that the man's more-than-enough wheat, stored in his barn, helps All-the-people, because it is a reservoir from which wheat can be taken when it is needed to help do things. If a mill is needed to grind the wheat of All-the-people, the man with the stored wheat can lend enough wheat to pay for building a mill; or he can pay for building the mill himself. He can lend wheat to pay for building an inn for travelers; or he can build the inn himself. Of course, if he lends the wheat he expects it to be sent back to him and he expects the man who borrowed it to send back more than he borrowed. If he lends one hundred bushels of wheat, he expects to receive back one hundred and six bushels, let us say." "Because of the rats, for one thing." said Uncle Peter Henry. "The rats!" said Billy Brad. "What rats?" "The rats that eat his stored wheat," explained Uncle Peter Henry. "As soon as the wheat is stored, the rats try to gnaw into the bins and eat it, and they often do. The man must watch his wheat and mend his bins and catch the rats. And the rain spoils some of his wheat. It comes through the roof and wets it and sours it. And he must keep a sharp lookout for thieves who try to steal his wheat. No matter how careful he is, the rats and the thieves will get some of his wheat, and some will spoil. So, when a man comes to have much stored wheat, he must watch it all day and all night. He must spend all his time doing that, and measuring the wheat he is lending and the wheat he is being paid back. He has no longer any time to spend in growing wheat. Instead of growing wheat on one farm, he is helping a hundred farms grow wheat. He may, indeed, be ten or a hundred times as useful to the world as when he was growing wheat himself. But he must live, too, so he asks those who borrow and use his wheat to pay back a little more than they borrowed. The 'little more' is what feeds and clothes him, and replaces the wheat that is eaten and spoiled. It is called 'Interest.'" "I know!" said Billy Brad eagerly. "I get interest for my radish money in the Savings Bank." "Right!" said Uncle Peter Henry. "For it is just the same thing whether the more-than-enough that is saved to work as Capital, is radishes or wheat or dollars. If the farmer has saved his more-than-enough wheat he can keep it as wheat or sell it for dollars and keep the dollars. It is Capital either way. And there are rats and thieves always at work destroying dollar Capital just as they are at work destroying wheat Capital. There are taxes and spendthrifts and bad loans and poor investments and losses of all kinds always nibbling at the dollar Capital. Capital must earn Interest to replace these losses, for we must have Capital to keep the world going. If there was no Capital it would be necessary, for the good and comfort of the world, to create Capital." 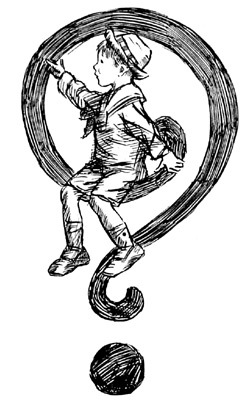 "Why, Uncle Peter Henry?" asked Billy Brad. "Because Capital is the great reservoir of yesterday's more-than-enough from which all the people with less-than-enough can be paid while they are working to have enough," said Uncle Peter Henry. "If there is a famine in the land, the starving people cannot get wheat from those who have none, but only from those who have some. 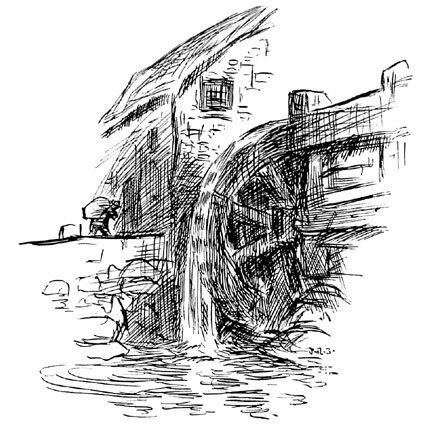 If I have a water-mill, I cannot turn the wheel with the water that I have let run by, but only with the water I have held back with my dam, or that another man has held back with his dam. There must be Capital to feed those who are working today to make or grow or build something that will not be completed until tomorrow." "Like my corn farm," said Billy Brad. "Or like a perfect world," said Uncle Peter Henry. "I'm going to make my scarecrow first. Before I plant any corn." "A very good idea," said Uncle Peter Henry. "Oh, there's Henny!" cried Billy Brad, catching sight of Henny Staples, who was taking a short cut through the schoolhouse yard. "Hello, Hen!" he shouted, "I'm going to make my scarecrow now. Uncle Peter Henry says I can have his floppy coat. I'm going to buy some nails. Come on over and help me, Henny." "All right," Henny called back, "I'll bring the hammer and we'll make a good one!"